Rock God Death-Fugue was written by Steve Bean with fair use, public domain or CC BY-SA illustrations. The publisher is Steve Bean Games. 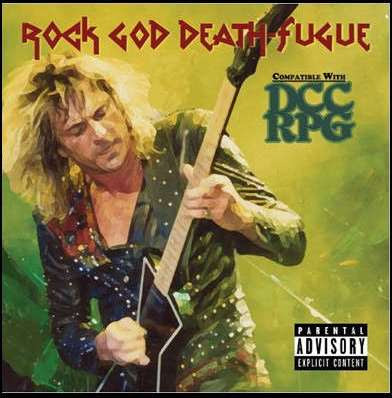 Rock God Death-Fugue is similar to Country Crawl Classics, Inferno Road, Null Singularity, and Black Sun Deathcrawl, in that it is a one-shot adventure that, in the end, the PCs are not expected to "win". They can, however, have better or worse outcomes. In this case, your characters are members of a heavy metal band on on the German leg of its first world tour. Everything that can go wrong will go wrong, and everything that can go right will also probably turn out to be wrong in the long run. This is the rock-and-roll lifestyle, baby, and no one gets out of it alive...or at least, not significantly worse for the wear. There is a cool mechanic modifying the spell duel rules so that your band members may "Contend for The Limelight" during each performance. The judge provides every PC equal opportunities throughout the adventure to Contend for The Limelight, but the judge chooses who gets the opportunity in each case, generally dependent upon events away from the stage. Every Rock God also has a dark flaw that influences role-playing, and manifests in various encounters. Two second level spells, aura of the Dark Muse and the Dark Muse provides, are included in the adventure. Their applicability to other settings is open for debate, but it is not at all impossible that these could see play outside Rock God Death-Fugue itself. In fact, those modifications could replace the funnel if characters were created at 1st level (or higher). Rock God Death-Fugue "explores themes of artistry, envy, excess, hubris and the cost of immortality-through-popular-media." Judges are warned that, "if you’re going to play it in public, make sure you’re in a place where you won’t cause (yourself) problems if your players get carried away." Because they will. The PCs are “rock gods” weaving musical “magic” and indulging in all the debaucheries and dangerous habits of the rock ‘n’ roll lifestyle. To make matters worse, the PCs all show up listening to Writhe Through Shadow by the band Atramentous – also known as “The Cursed Album.” It’s certain they’re headed for a bad end, the only question is whether they go out in a blaze of glory or as sad self-parodies like Axl, Elvis or the Ozzy of The Osbournes era. The adventure alternates between encounters on the road that threaten to derail the tour – or worse – and the band’s shows. In concert, egos, insecurities & aspirations to true artistry take over, creating PvP musical duels. The outcome of these duels determine how history remembers each rock god! ROCK GOD DEATH-FUGUE is a 8.5" x 8.5", graphics-rich product designed and laid out as the liner notes of Writhe Through Shadow, the legendary "Cursed Album" by the fictional alt-rock band Atramentous.